After a run of mediocre to downright disappointing releases, DC Comics finally gets a movie worth eating overpriced popcorn in a room full of strangers. It’s as if all the world’s been waiting for Wonder Woman and the power she possesses. Compete’s Maddy Myers and I saw the movie over the weekend, and we have such thoughts to share. 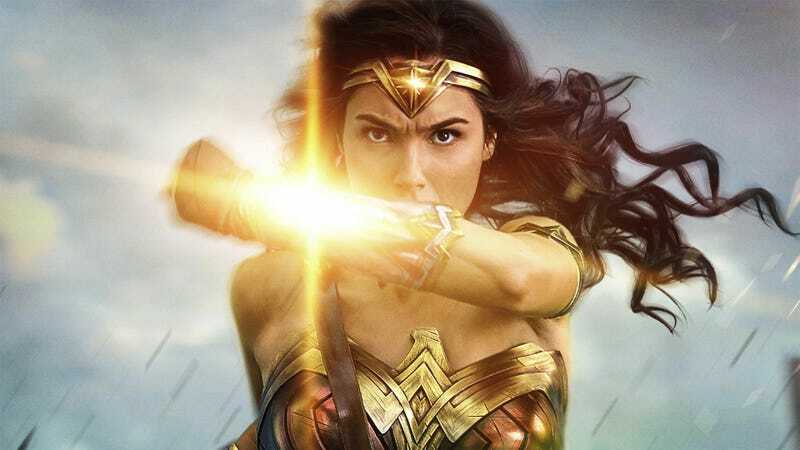 Michael Fahey: What would you say is more impressive, Maddy—that we finally have a blockbuster comic book movie featuring an iconic female superhero, or that DC managed to make a good movie this time around? Maddy Myers: Honestly, the latter. I’ve been reading a lot about how hard Patty Jenkins had to fight in order to make the movie the way she wanted it to be made. It feels very different from the other DC movies we’ve seen so far, so I’m pretty thankful she got her way when it came to composition, color balance, and the inclusion of Diana-centric battle scenes like the iconic No Man’s Land walk... a scene which, apparently, Jenkins had to fight to include. What is DC even doing? That’s a separate chat, but ... are they okay over there? Are they okay. Anyway. Fahey: I’ve read a lot of the post-release interviews with Patty Jenkins, and it almost feels like she had to put more effort and force of will into making the movie she felt Wonder Woman deserved than Diana herself did in that No Man’s Land walk. DC is not okay, but strong direction just might see it through. Maddy: There was a low bar to clear when it comes to DC movies, and also a low bar when it comes to Wonder Woman movies. That’s not to undercut what the movie does do, by any means, but I think it’s worth reiterating that. This movie has a lot in common structurally with the movie-length mid-1970s pilot episode of Lynda Carter’s Wonder Woman, as well as the 2009 straight-to-video animated Wonder Woman movie, both of which are action/romance stories featuring Steve Trevor crash-landing on an island of women, meeting Diana, and traveling back with her to The World of Man. I used to actually recommend that 2009 animated movie, but it does not hold up under 2017 scrutiny. The 1970s show has a lot of problems, too, although that’s more expected, given the decades that have passed since. Wonder Woman’s origin is usually a “fish out of water” story. She comes from a completely different society than ours, so she’s in a position to observe our society as an outsider. I’m not going to say this movie is perfect, by any means, but it does a better job handling this dynamic than other Wonder Woman movie adaptations I’ve seen thus far. Diana is unfamiliar with our world, but she’s not a ditz or a childlike innocent. If anything, she’s smarter than we are. We’re the ones who need to rethink our path. That doesn’t mean Diana is 100% right or perfect, or that her homeland’s isolationist warrior ways are correct either — but it does invite the question of the right way forward, as any good Wonder Woman story should. Fahey: Well I was going to ask you how familiar you were with Wonder Woman going into the movie, but I think you’ve answered that question. I’ve had a deep appreciation for the character since I was a small child, much earlier than when you were a small child. I watched the 1970s show with Lynda Carter when it was first airing, often with my mother. I’ve always associated the two. My mother was (and still is) a statuesque 5'11" brunette who, as the story my step-father likes to tell goes, once was chased through LAX by tourists who thought she was Lynda Carter. She raised four children, mostly on her own, all while running her own dancing school. Strong, independent, caring but willing to take a stand against the forces of evil children. I am not saying my mom is Wonder Woman, but my mom is Wonder Woman. Maddy: Whoa. I hope your stepdad is more like the Steve Trevor in this movie than the ones of adaptations past! Fahey: My mom wishes my stepdad was Chris Pine. Not that he isn’t an above average example of . . . yeah, not going to think about my stepdad’s junk. Maddy: Chris Pine’s Steve Trevor is quite the romantic lead, eh? In the 2009 adaptation, Nathan Fillion plays the role and the movie is very centered on him: how he sees Diana and the Amazons, how he comes to terms with their society being different from ours. This movie is all about Diana. Again, that’s an upside and a downside. The lack of focus on the other Amazons is the main complaint I’ve seen about this movie, and it’s a fair one. This movie is very simple. I’ve described it as “a gender-swapped version of the first Captain America movie,” and I don’t think that’s entirely inaccurate. I say that as a person who genuinely enjoyed the first Captain America movie, by the way. But we all know Winter Soldier was the meatier entrant in that series. I’m hopeful that Wonder Woman will get its Winter Soldier. Fahey: Funny you should mention the lack of focus on the Amazons. My wife, who is only familiar with Wonder Woman from TV show reruns and the Justice League Unlimited cartoons I made her watch every night for weeks after the complete series set came out, was surprised to learn that the Amazons on Themyscira played such a big role in the opening of the film. She said she would have been more excited about going to see it had she known. I do wish we had seen more—bows and arrows and swords against machine guns was such a joy—but I get that there was only so much time they could spend on the island before setting sail. Well, the first Captain America movie took place entirely during the second World War, so there was no real fish-out-of-water element to it. They saved that for Avengers. Hopefully the Wonder Woman we see in the Justice League film will bring the full weight of what, a century of living in the outside world? I want that wisdom and experience to shine through. Maddy: What makes Winter Soldier special is that it’s a male friendship story, and if we’re talking about breaking barriers in superhero movies, which we have to when it comes to Wonder Woman, then I think the next step is for us to see a version of that story with two women. The Amazons have always had internal disagreements about how best to handle the problems that arise in The World of Man, so there are a lot of different directions that a second movie could go. It’s possible for me to even think about that possibility because the first Wonder Woman has been so successful. And this is a movie that had—and still has—an astounding amount of scrutiny and pressure to be a “perfect” movie (and a “perfect feminist movie,” whatever that could possibly mean). It is not, because nothing is. But it has nonetheless allowed me to feel some hope about what DC movies could be. It also feels like a snapshot of where superhero movies are at right now. Perhaps that snapshot is still behind where we would want them to be — something like Wonder Woman feels long overdue, no? But nonetheless, this is where we’re at, and at least we got here. Anyway. Tell me your favorite scenes or something. I’m getting way too high-minded in my responses, haha. I like the part where she eats the ice cream cone — her earnest and compassionate appreciation for life’s joys, no matter how small. Fahey: “You should be very proud!” Man, I am going to use that line forever. Whenever there is ice cream to be eaten, I shall inform the makers of their success with as much sincere praise. My favorite moments, and these feed into our wish for more Amazons, were any time Robin Wright wielded a weapon. The fight choreography in the movie was spectacular, sure, but where other Amazons felt like they were acting, I totally bought Robin Wright as a battle-hardened warrior. I would watch an entire film of her exploits alone. Maddy: For sure. Shout-out to the use of slow-motion shots in the Amazon sequences. And here I thought I was tired of slow-motion shots in superhero fight scenes...! I could watch a montage of Amazons fighting for the rest of my life and not get bored. Maddy: Also, to get into Big Spoiler Territory, I liked that the “twist” of the movie is that the affable British white guy that our heroes have been trusting throughout the movie turns out to be the embodiment of war. The movie’s denouement doesn’t fully navigate the import of that, but the idea of Ares characterizing himself as a paternal mustached gentleman struck a chord with me. I don’t know that the movie is making a broader statement about Western imperialism and colonialism, or anything — that would be a reach — but it was an interesting choice. Steve’s warning to Diana that “you can’t just kill one guy and end the war” is also a compelling point that doesn’t quite get answered by the movie’s end, even though Diana does go on to “kill the one guy.” Both of them are right, in a way: you should probably still kill that one guy, but also, people are complicated. Fahey: I feel as if I knew he was Ares from the beginning—he was just too affable. I was expecting some sort of transformation into a more traditional vision of Ares towards the end of the film, but nope, they kept David Thewlis in the costume right up to the bitter end. Speaking of killing the one guy, what did you think of Steve Trevor’s heroic sacrifice? Diana’s resolve seems to be fading as Ares presses his assault, all seems lost, and then Chris Pine dies, and Wonder Woman goes full-on berserker mode. What message do you think that sends? I think the filmmakers were trying to say that no problem can’t be overcome by Chris Pine exploding into a million pieces. What’s your take? Maddy: Haha. Well, speaking of “I knew the whole time,” I did know the whole time that Chris Pine would die, and that he’d probably die in a form of heroic sacrifice that would be in service to Diana’s story. The longer the movie went on, the more clear it became that this would happen. He also plays the “Honey Pot” role—another classic gender subversion! I guess it’s only fitting that he’d get “fridged” at the end, right? Setting this movie in the past meant that Steve Trevor wouldn’t be a factor in Diana’s future, which we’ve already seen bits and pieces of in Batman v Superman. He’s her Peggy Carter. I guess they could have put Chris Pine in old age makeup and given him a fun spin-off on Hulu, though. Real missed opportunity there. If you think about it, though, all of Diana’s friends must be dead at this point, even if they didn’t sacrifice themselves in the heat of battle. And that is sad. Now she has new, grumpier friends. Like Batman. Fahey: Aww man, I would have loved Steve Trevor: Agent of Whatever The Intelligence Agency Was I Was Not Paying That Much Attention. And don’t be sad for Diana. Most of her friends are dead, but she’s got Batman and Dead-For-Now Superman to keep her company, as well as Khal Drogo, Bungie Cord Flash and Guy Partially Eaten By A Nvidia Graphics Card. Maddy: That costume was so controversial at the time but I admit to still totally loving it. Wonder Woman in pants!!!! I long for the comic book controversies of 2010... they seem so quaint now. Fahey: I think it was just that she stole Rogue’s jacket, and that was rude. If I had my pick though, I’d want to see something like the Vertigo-ish, myth-infused New 52 run. Maddy: Anyway, we should probably try to wrap this up, right? Before we go, I do want to point out that I’m not a fan of the trope of making a female villain conventionally unattractive in some way and/or suggesting that’s her motivation for being evil. Unfortunately, this Wonder Woman movie falls into this trap with Dr. Poison. Oddly enough, the 2009 animated Wonder Woman movie does the exact same thing (one of the Amazons who falls to Ares’ influence also has a facial scar). It’s an issue with the script, and I’m not sure whose idea that was, but I do wish they’d gone in a different direction with Dr. Poison. Fahey: Doctor Poison could have been worse. Maddy: Oh, god, yeah. I’m not going to defend the original depictions of Dr. Poison, either! I almost want to recommend the 2009 animated Wonder Woman movie to our readers after all, simply to serve as a counter-example—it’s like 2017's Wonder Woman, through a glass darkly. The few missteps that this movie makes, the 2009 movie also makes, but far more inflated. Fahey: Definitely second the Wonder Woman 2009 animated recommendation. It’s a pity we couldn’t have Lucy Lawless, but we’ll always have Xena. Maddy: The few problems I have with WW 2017 stem from the script, which Patty Jenkins wasn’t responsible for. I’d love to see future WW movies have women writers and women directors, not just either/or. I also want a WW story that’s less straight and less white, and I firmly believe that’s possible, too. Fahey: As you said earlier, the fact that we’re even talking about future Wonder Woman films is outstanding. This was a fine starring turn for one of comics greatest heroes, and I cannot wait to see what comes next.